Produktinformationen "Go! Motion to Calculator Cable"
This 84″ cable is used to connect a Go!Motion or CBR 2 to the I/O port of a TI graphing calculator. The cable has the small I/O plug on both ends. The cable can also be used to connect a graphing calculator to the I/O port on a LabPro, CBL 2, or another calculator. 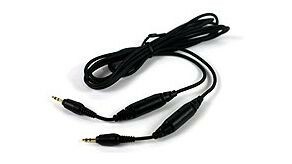 The cable is included with a CBR 2. Weiterführende Links zu "Go! Motion to Calculator Cable"
Garantie(Jahre) "Go! Motion to Calculator Cable"
Weitere Info "Go! Motion to Calculator Cable"
Kundenbewertungen für "Go! Motion to Calculator Cable"